NEW DELHI -- A four-story rickety hotel building collapsed in central India, killing at least 10 people and injuring another three, police said Sunday. 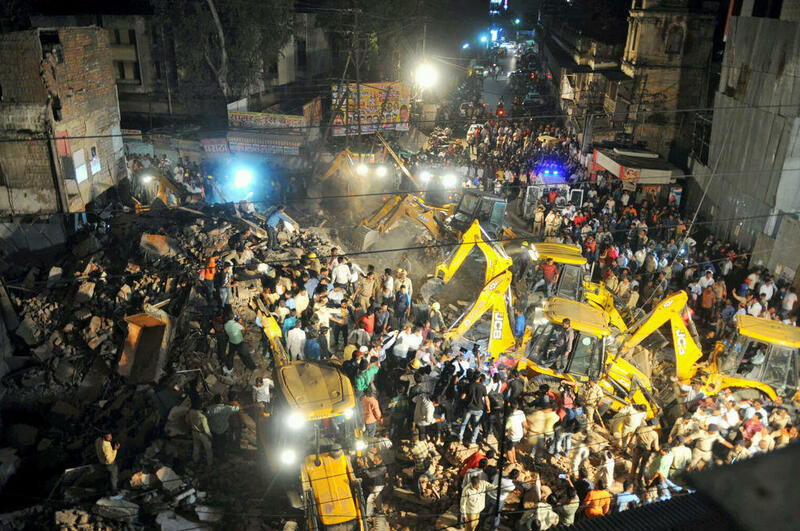 Rescuers working through the night with sledgehammers and chainsaws pulled alive 10 people from the debris of the building that came crashing down in Indore, a city in Madhya Pradesh state, on Saturday night, said police officer Sanju Kamle. Up to five people may still be trapped under the rubble, said Nishant Warwade, the district collector. The Times of India newspaper said the dilapidated building collapsed after a car smashed its front portion. The paper said the incident created panic in the bustling area that features a major bus stand and restaurants. The hotel with 25 rooms was located in the commercial hub of Indore, close to railway and bus stations. Indore is nearly 900 kilometres, or 560 miles, south of New Delhi. Building collapses are common in India as builders try to cut corners by using substandard materials, and as multi-story structures are erected with inadequate supervision. The massive demand for housing around India's cities and pervasive corruption often result in builders adding unauthorized floors or putting up illegal buildings. In August 2017, 33 people were killed when an apartment building collapsed in India's financial capital of Mumbai.